The Printable Consent Form is available beginning the Wednesday after the end of the quarter, through the end of the add/drop period, for courses that have enabled the online consent feature. NOTE: For Autumn quarter courses, printable consent becomes available the Wednesday after the end of the Summer quarter. Although forms become available early, they will not be accepted by the Registrar’s Office for processing until the first day of the quarter. Courses that do not use the printable consent form may have enabled the online consent form. 4. A new window containing the consent form will open. Click PRINT THIS FORM on the top left to print. 5. Click the RETURN button on the top right to go back to your search results. 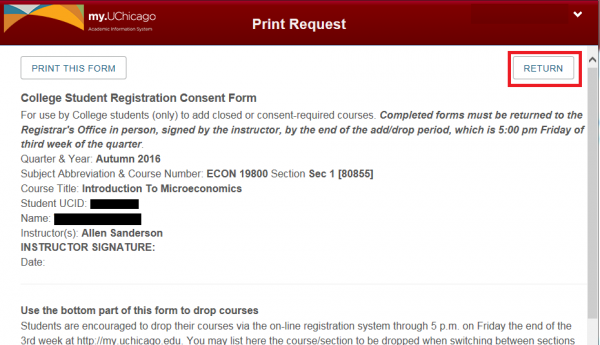 I'd like to request consent for a course but the Consent Form button does not appear. Am I doing something wrong? It is too early in the add/drop cycle. The Consent Form button will not appear until the Tuesday before the start of the Autumn quarter. If you are trying to print the consent form before then, you will not see the button. 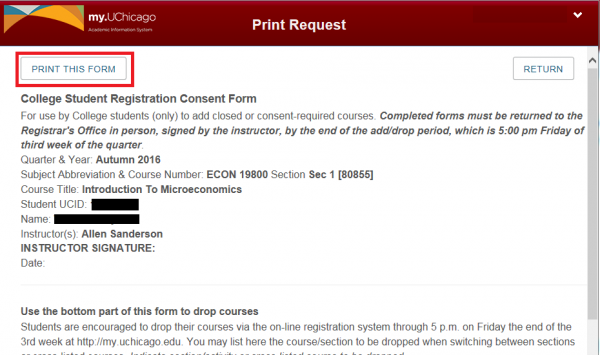 The course does not use the standard consent form (or “pink slip”) for registration. Either a different form is used (such as the Reading and Research form) or a completely different petition process is followed. Read the “additional notes” associated with the course for direction, contact the department administrator, or visit the College’s Graduate and Professional School Courses page for more information. You are not eligible to register for courses because you have a restriction on your account. You may check the status of your restrictions in myUChicago and find contact information for the restricting office. The restriction must be cleared before you will be able to register. Where and when can I turn in my signed consent form? Signed consent forms will be accepted by the Registrar’s Office for processing begining the first day of the quarter. Forms will not be prior to this date. The Registrar’s Office is located in the Press Building, 1427 E. 60th Street, Suite 172.